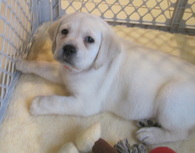 Let's give a big round of A-PAWS for the most recent arrivals delivered by our favorite Seeing Eye "stork," Katie, into the arms of our Caring Eyes Puppy Club volunteers. Baby Daria- Bundled up and ready for the upcoming Winter. Daria was welcomed to handler, Georgie, and her mom, Anne, on December 14th, 2016. 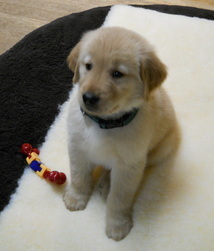 15 month old Seeing Eye Puppy, Raisin, was there to welcome her along with Therapy Dog, Grace. Daria's parents are Forrest and Gretel. She came at 8.5 pounds! Baby Ulene - Doesn't want to be too far from her food dish - food in a bowl is a new experience. Tricia and Becca welcomed their beautiful baby girl into their home in 2012. Ulene is Tricia's 2nd pup as an adult, but she raised 3 as a teenager! Ulene's peeps, Trica and Becca, say she's super sweet and loyal and loves to play and run! Isn't she a precious pudgie? My peep "Mommy" says I'm her best little girl! 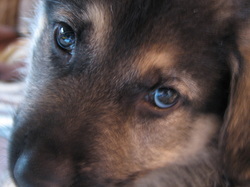 The Seeing Eye would now like to introduce Halle - one of our most recent addtions to the BCCEPC of Woodcliff Lake. 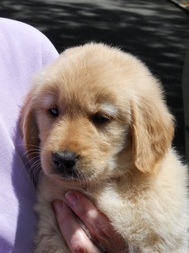 Mary and Richard are very excited to raise another wonderful pup for The Seeing Eye. Are the girls outnumbering the boys with these latest additions? Looks like Labs are taking over too! 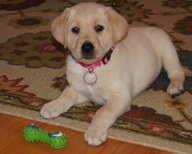 Halle's peeps, Mary and Richard, say she's a wise little girl for her age and the best puppy ever!. Another furry beauty has been delivered! Forget Miss New York - Here's Beulah of New Jersey! And doesn't she look smashing in her vibrant pink collar with black and silver accents? Eliza and Nicole welcomed this little fur ball into their lives and home with open arms and a bucket full of toys. Beulah is Eliza and Nicole 's first pup and the excitement is electrifying! Beulah's peeps, Eliza and Nicole, say she's happy, sweet and affectionate to everyone she meets - a wonderful Seeing Eye ambassador! Bridget and Eryn welcomed 7 week old Iris into their home - they plan to shower her with lots of love and she, in turn, will shower them with lots of licks, sprinkled with some pearly white teeth. 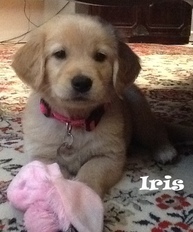 Iris is fluffy and soft and looks smashing in pink. She's already breaking hearts. A very big round of A-Paws for our newest addition to the Woodhour ranch! "Mommy, I'm a boy and would like a more "manly" toy - this one looks like your necklace!"